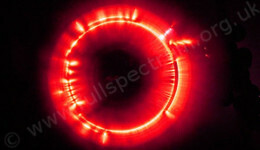 We have over 30 years experience of working with Kirlian photography. If you want it done the Kirlian way Fullspectrum can help you do it. If you would rather do it yourself we can supply all the equipment, kirlian cameras, training, advice and support you need. If you would like to see the JAK Kirlian cameras in operation just go here. 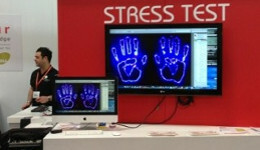 If you would like to use Kirlian photography on your exhibition stand as a unique attraction for your clients’ entertainment we can help. Maybe you would like us to come along to your event, party or seminar and take Kirlian photographs of your guests. 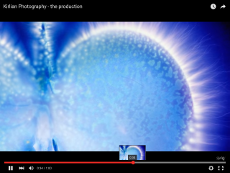 Perhaps you would just love a beautiful Kirlian image to hang on your wall or use in your design project. For all this and more please go to our services page to see what we offer. 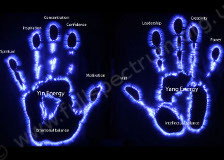 Kirlian photography also known as radiation field photography or Electro-photography, will take you into a world of energies and energy fields that surround everything. Capturing the beautiful patterns and flares of light that these fields produce is what Fullspectrum’s Kirlian cameras are designed for. 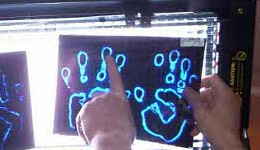 Many people could find Kirlian photography both an attraction to their clients and an asset in their work.